If any of the Manolo’s British internet friend are in the market for the women’s designer shoes, they should consider looking at the Daniel Footwear, the online shoe shop with the excellent service and the good prices. The Irena platform from the Pour la Victoire. Also, this remarkable, burgundy mid-wedge shoe from the Tory Burch. And, their own house brand, the Daniel shoes are very much worthy of your attention. Yet More Boots for the D.C.
Manolo says, in this morning’s column for the Express of the Washington Post, the Manolo must admit that he felt constrained by the restrictions imposed by his internet friend. Here is the Cookie from Aquatalia by Marvin K., the suitable weatherproof alternative to the La Canadienne boots. The Donovan Logo Boot by Tory Burch. The Miss Tack Botta 85 Tall Boot by Christian Louboutin. 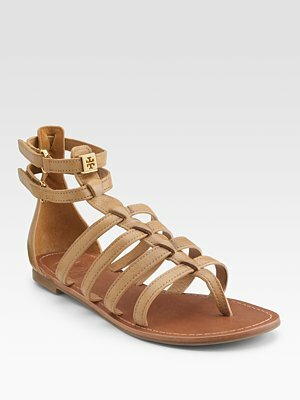 Tory Burch Blondie Flat Sandals on the Sale! Manolo says, here is the stylish Tory Burch Blondie flat sandal, perhaps the last final gasp of gladiatorism, on the deeply discounted sale, over 50% off of the normal price. Manolo says, here are the fun and colorful Tory Burch t-strap sandals for your Thursday afternoon enjoyment. Before you know it, summer will be here, and you will want colorful flat sandals that make you feel happy, and these they are emphatically cheerful.